The terms thyristor denotes a family of semiconductor devices used for power control in dc and ac system. One of the oldest method of this thyristor family, called silicon control rectifier. 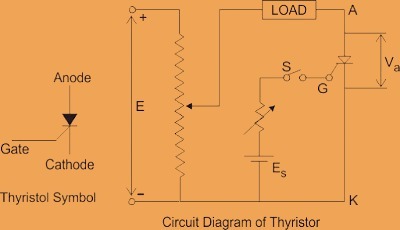 An elementary circuit diagram for obtaining static I-V characteristics of a thyristor is shown in figure. When cathode is made positive with respect to anode with switch S is open. Junction point J1, J3 are seen to bee a reverse biased whereas junction J2 is forward biased. A small leakage current of the order of a few mill amperes . 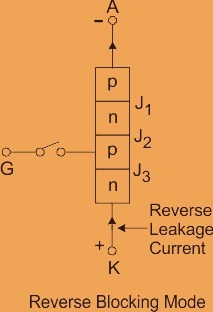 This is reverse blocking mode, called the off- state, of the thyristor. 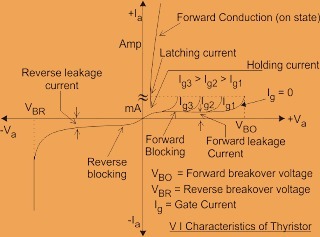 In reverse blocking mode to shown in I-V characteristics of thyristor. When anode is positive with respect to the cathode terminal, at that time gate circuit is to be open and a thyristor is said to be forward biased as shown in figure. It is seen from this figure J1, J2, J3 are forward biased but J2 is reverse biased. As the forward leakage current is small, SCR offers a high impedance. Therefore, a thyristor can be treated as an open switch mode even in the forward blocking mode. 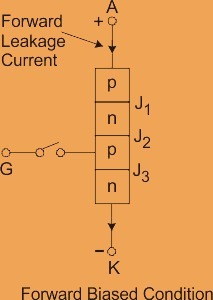 When anode to cathode forward voltage and it is too much increased with gate circuit open, reverse biased junction point J2 will have an avalanche breakdown at a voltage called forward break over voltage VB0. 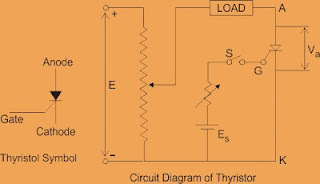 (This is on-state) after this breakdown occur, thyristor gets turned on with point shifting to the another point and this point anywhere called forward conduction mode.